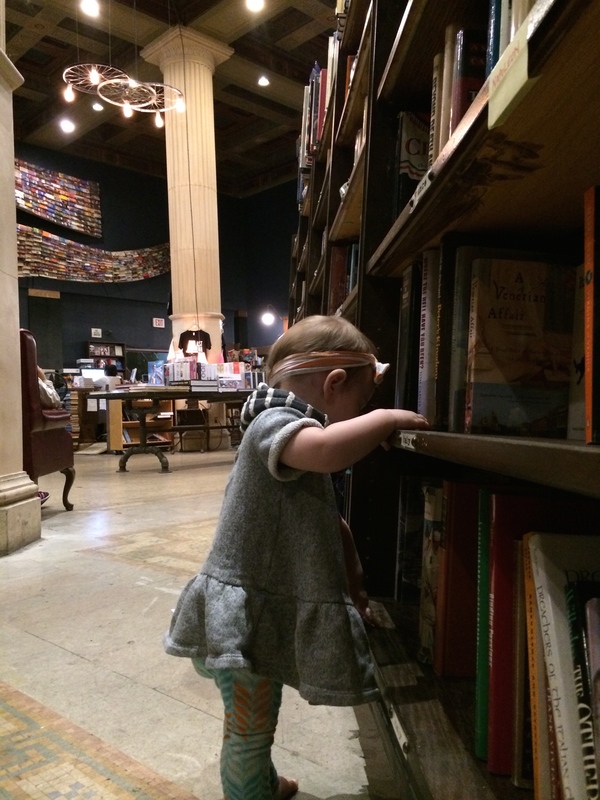 The Last Bookstore – used books and records – Los Angeles – this was our most recent visit. Aside from the fact that as we walked in with Moira the staff looked at us like we were holding an octopus, it was surprisingly hospitable for downtown LA. They even allowed us a quiet corner to change the diaper of our pet octopus while their bathrooms were out of order. 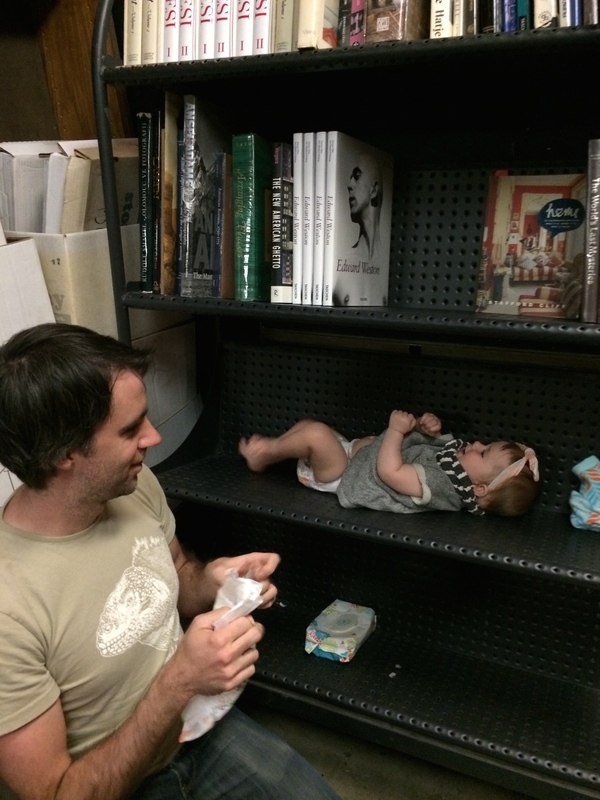 Changing a diaper at The Last Bookstore. 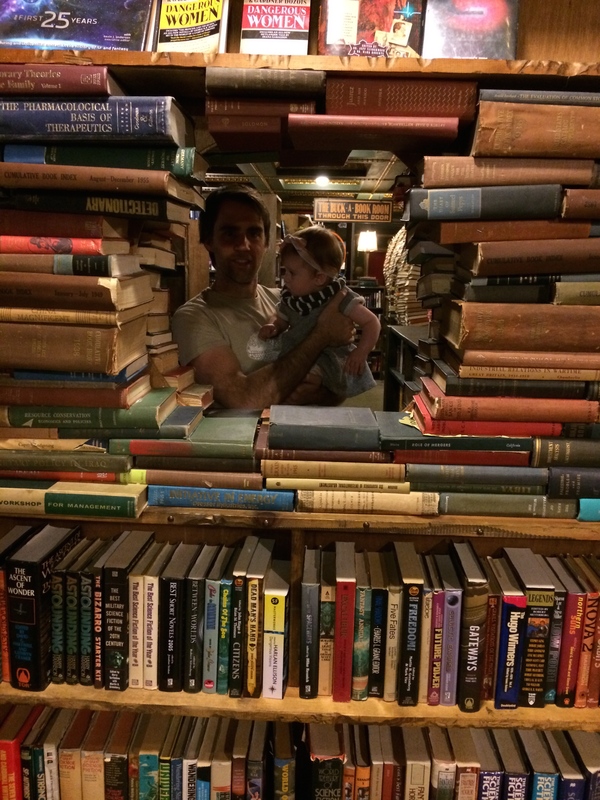 The downstairs is well curated (their website is forthright about the authors they will purchase), and the overflow of paperbacks that inevitably amass in a used bookstore has been channeled into the upstairs “book labyrinth,” a visual feast. The steam punk atmosphere draws a colorful crowd, the celluloid negative of the LA glitterati. 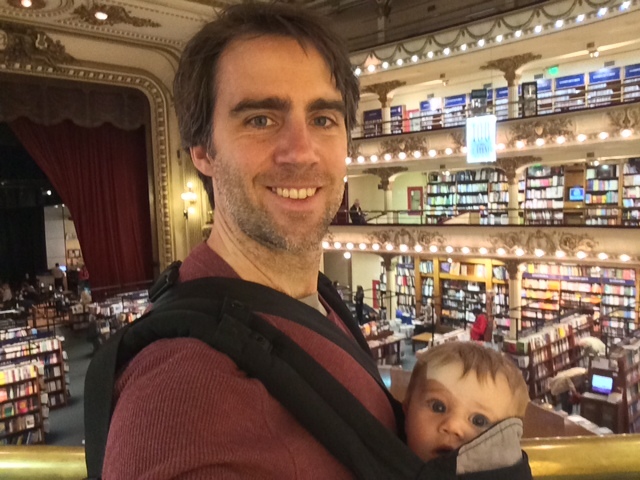 Tattered Cover – new books and coffee – Denver – while I was serving as maid of honor in weekend of downtown Denver wedding festivities, Lewis spent his time drifting in and out of the store’s 16th St location and its nearby coffee shops in LoDo. The store was huge, but organized in such a way as to provide ample opportunities for squirreling one’s self away between shelves. 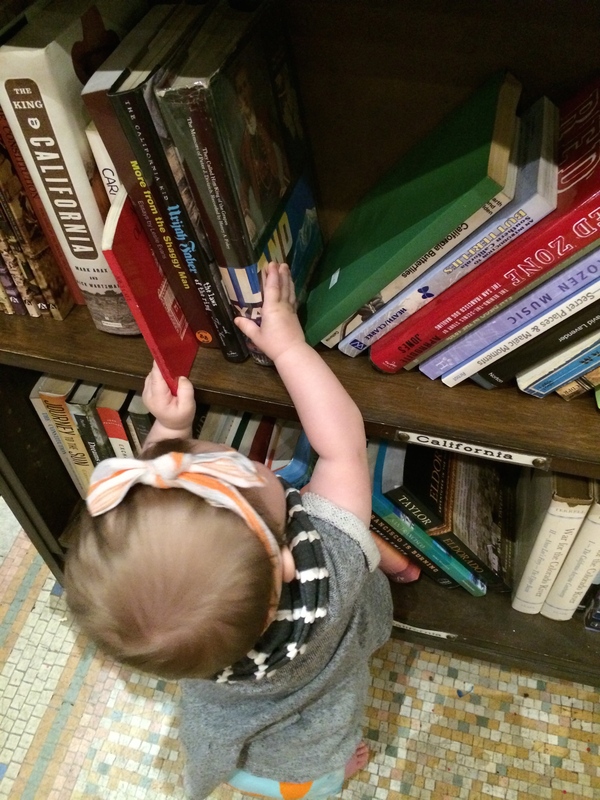 I liked Tattered Cover because it was laid back about being indie. I didn’t feel like I had to hide the fact that I have ordered books from Amazon, but the selection was so good that if I lived in Denver I probably wouldn’t need to order books from Amazon. Bart’s Books of Ojai – used books – Ojai, CA – this was another wedding discovery. This time it was Lewis serving as groomsman, while I lounged in the tub at the hotel and tore through the Hunger Games series. In the downtime, we explored Ojai, with it’s distinctively California way of blending farmers, wealthy people, and hippies. We had some lovely vegan food at one of the most committed vegan restaurants I have ever seen. And fortunately, as I finished Mocking Jay (and threw it across the rooms, angry at the 3 hours lost to reading it), we found Bart’s Books of Ojai. Bart’s has the feel of a market. The bookshelves are under cover, but the entire place is open air (and wet, as it had been raining), which would only work for a used bookstore where a little humidity wrinkle adds to the charm. It’s refreshing to disappear among dark shelves, only to emerge into an open courtyard. And there I traded in Mocking Jay for Bonfire of the Vanities. Best trade ever. Daedalus Bookshop – used books – Charlottesville, VA – I went here with Lewis while we were dating. Again, in town for a wedding, we utilized the awkward lapse between the the ceremony and the reception to make a stop at Daedalus and descend into the basement via a narrow stairwell surrounded by all kinds of books, with no apparent criteria for selection. It’s a place to wander in and see what grabs you. I left with a rather terrible Larry McMurtry novel, and Lewis fared better. Daedalus is the authentic kind of used book store for people who love shopping for books. How they even get all those books (near 100,000) into their tiny property is amazing. It’s the sort of place you could spend an hour or maybe five. Marfa Book Company – new books and great guest speakers – Marfa, TX – everyone who goes to Marfa is familiar with the Marfa Book Company. It’s the ultimate resting spot of the educated, urban refugees who wander the streets in search of inspiration for their creative projects, wondering exactly when the art galleries are open. It is impeccably curated. There is nothing in that store that I wouldn’t read. Often, the authors and artists who retreat in Marfa will give readings or talks in the evenings. For those not familiar with Marfa…yes, it’s in the middle of the desert. Yes, the second largest industry in the town is art. The Twig – new books – San Antonio, TX – because it’s my hometown indie shop and I am thankful for it every day. Friendliest staff, good fiction. One of my happiest places.